This month, Community Cycling Center will turn two vacant lots in the New Columbia neighborhood into a Bicycle Repair Hub which will provide affordable bicycle repair and maintenance clinics. The project represents the collaborative efforts of the Community Cycling Center, Home Forward, Portland Development Commission, Bikes Belong, and the Bike Gallery, along with All Can Ride, a resident-led bike committee at New Columbia. The Community Cycling Center will work with graduate students from the Oregon College of Art and Craft and Pacific Northwest College of Art’s joint MFA program in Applied Craft and Design (ACD) to transform empty spaces into dynamic and creative learning centers. Students will spend three days in design charrettes with New Columbia residents starting August 20, and construction will be completed by August 31. 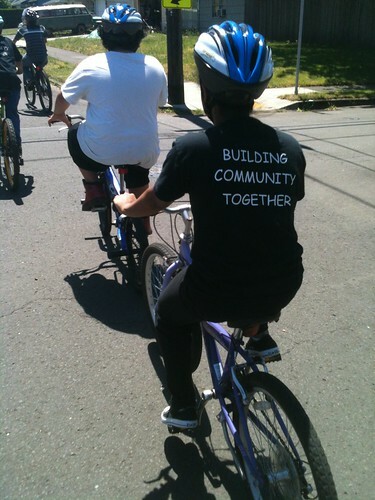 You can contribute to the success of this project by making a donation online, or by donating a bicycle at the center’s bike shop at 1700 NE Alberta Street.